If you are suffering from what I call “pollsy,” the state of being bombarded by one campaign poll after another, do yourself a favor. Ignore most of them. Save your energy for the only one that counts. On Tuesday, November 6, the general election takes place, and it could be the most important vote you’ll cast in your lifetime. If you hope to see America progress, you’ll know how to vote. The numbers I care about are the white vs. non-white vote. Since 1980, the number of white voters has dropped from near 90 percent of the electorate to just 74 percent in 2008. In this year’s tight race, with African Americans and Latinos overwhelmingly for Obama, Asian Americans could mean the margin of difference for somebody. And yet despite being the fastest growing minority group in America, we are by and large the most ignored. For example, none of the polls will tell you about Asian Americans, where it’s out of polls, out of mind. But a number of polls do point the way of Asian America. The updated National Asian American Survey (1,031 adults interviewed mid-October, 483 likely voters, 4.5 percent margin of error) saw Obama actually surge from 43 percent to 50 percent among likely voters. Romney actually dropped from 24 percent to 19 percent. This is even after the disastrous first debate in Denver. And there’s still 30 percent undecided. But I’m bothered by the likely voter category. Just 50 percent of the eligible Asian American adults surveyed are voting. In the end, I don’t care whom you vote for. But you need to cast a ballot in this game. Around the country, forget party. There’s reason just to vote Asian American. Grace Meng for Congress looks inevitable in New York. But Jay Chen’s congressional race in the Hacienda Heights and La Habra Heights area in Los Angeles County is close and getting nasty with a plethora of ugly campaign signs cropping up in his district. 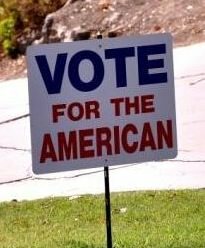 This one that says “Vote for the American” was posted on a lawn. It’s a lot more subtle than a flaming cross. But it comes from the same DNA. But the race is getting personal for Chen, so that voting Asian American makes perfect sense. Given the kind of xenophobic attacks Chen’s endured, voting is the only way to strike back. After all, voting is about representation. Considering our numbers, isn’t it time we counted? _SANDY, THAT MARATHON, AND MORE ON THOSE SF GIANTS_Thanks goodness someone had the taste not to stage the New York Marathon this weekend. Mayor Bloomberg followed up on his Obama endorsement by making the correct decision on the marathon. Bloomberg playing a fiddle in running shorts is not a good image. Sure, a marathon can be inspirational and a metaphor for great triumph over self-imposed recreational physical agony. But I find something offensive about watching runners reach out in desperation for water bottles during a race, while thousands of New Yorkers are on a different kind of race for survival after Hurricane Sandy, reaching out with limited success for the basics–water, food, and electricity. The only way I’d hold the race as scheduled is if somehow the runners were hooked up to some massive treadmill that could keep the lights on in Lower Manhattan. Or if the runners, as some did on Sunday, made their marathon the actual door-to-door delivery of food and supplies to victims. Otherwise, the city has business to take care of post-Sandy, and it’s not to appease the marathon running cult. Sports surely is a luxury. But it can have an important function in times of crisis when the rooting interest isn’t thousands of individual runners, but of a team that is symbolic of a community. Aside from the legendary short-cutter, the cheater Rosie Ruiz, I can’t name one legitimate winner. But I do know most winners come from Kenya, which during a political season would give those inclined an opportunity to make a birther joke (not me). Recently, I wrote about what lessons all of America could take away from the example of the San Francisco Giants victory. 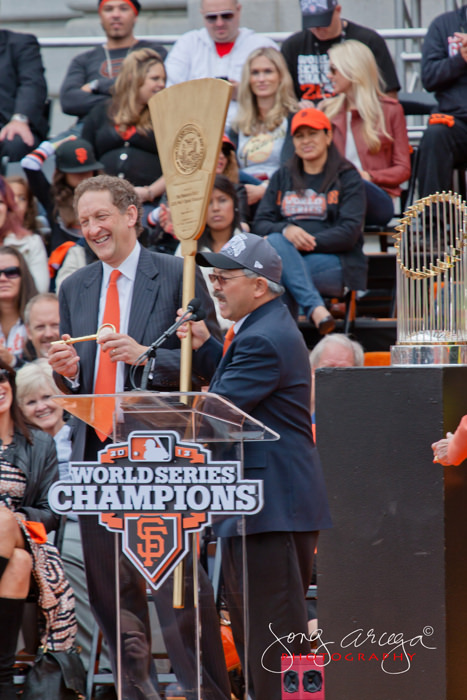 And the parade last week in San Francisco was an astonishing event, one that literally brought together a community of fans for a moment of civic love and appreciation. The crowd was estimated at more than a million people. I was up in the press stand at City Hall, so I couldn’t get a good view of the entire parade. But I’ve seen close to a million on the Washington Mall, and a million in Manila during the funeral procession of Benigno Aquino, Jr.
Last Wednesday, sure felt like a million. I just kept thinking: what if all of these people voted? Or were as excited about the upcoming election as they were about their World Series Champion Giants? Not to be insensitive, the Giants did announce an appeal for Sandy victims and the American Red Cross. “If everyone gave a dollar…” said the announcer. But really $1 million just doesn’t make a dent in light of the tens of billions needed to rebuild after Sandy. It surely made people like New Jersey Governor Chris Christie rethink the real virtues of big government, especially after Sandy made his entire state newly-minted members of the 47 percent Romney likes to chide. the winner of the presidential election nearly 90 percent of the time. That’s better than any batting average or win percentage around. 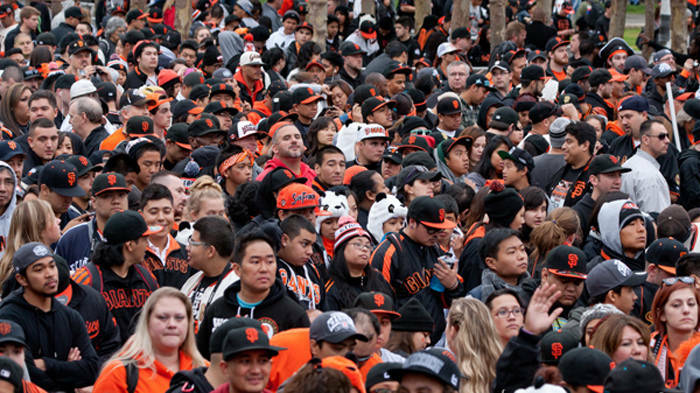 This year, the Giants had the home field advantage in California. And this year California is staunchly for Obama, ergo…. Oh, but so much for stats. Before the Series, the Giants on paper looked like dogmeat. As the saying goes, that’s why they play the games. And there’s a big one to play on Tuesday. You are playing, aren’t you?